Are you passionate about chocolate? Want to learn everything about chocolate? 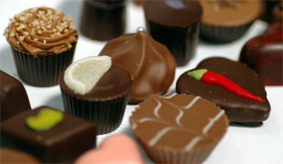 Then our Chocolate Connoisseur's Appreciation course is the answer. We will cover everything from the history of chocolate and how it is made through to origins and blends, specialty chocolates and chocolate desserts. Our first evening in Sydney is on March 1, 2006 at 6:30pm. Our first evening in Brisbane is on May 11, 2006 at 6.30pm.